Our software will help you to write and read an e-book or textbook. You have all the power of multimedia at your command: animation, graphics, audio, video... And with our script language included, you can even make the pages of your books come alive! The perfect tool for creating and editing electronic learning materials, references, manuals, and other computer documentation. It's easy to use and is rich with features for presenting information. Read e-books and textbooks the way they were meant to be read. With this free program you can distribute your e-books on CDs and DVDs hassle-free – users don't need to install anything on their computers. 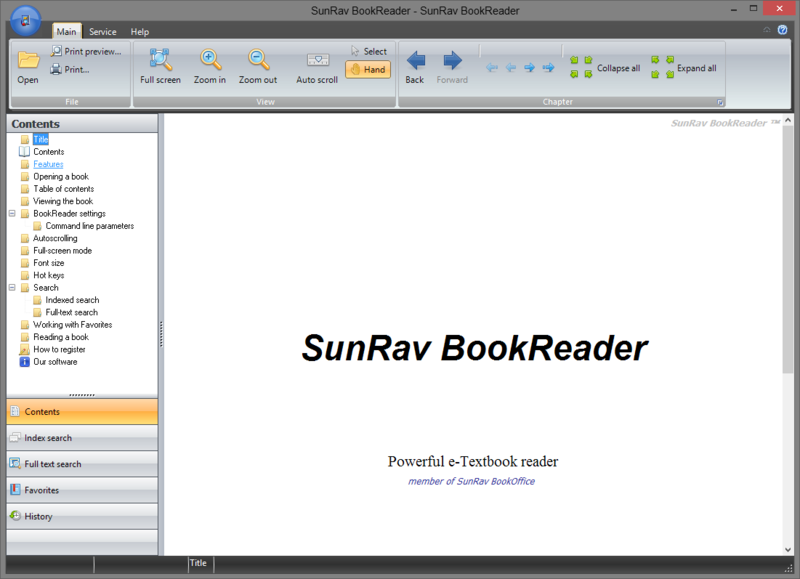 With SunRav BookEditor you can create e-books, textbooks, e-dictionaries, encyclopedias, and more! Export them as HTML, CHM, or PDF documents and generate documents in any format (using templates). You can compile your books as EXE files as well. Styles – define styles in your text for rapid and consistent professional formatting. Spell check – check your spelling as you go. Tables – use tables (including nested tables), which can be helpful when creating page mockups. Import – import all documents from a single folder with automatic sectioning. The fastest way to transfer your documents to SunRav Book! Import books from CHM files as well. Links – jump around the book and launch documents and programs as needed. Add links from anywhere to chapters in the current book, other books, tests (using SunRav TestOfficePro), websites, or any other documents. Links can be opened in pop-up windows. 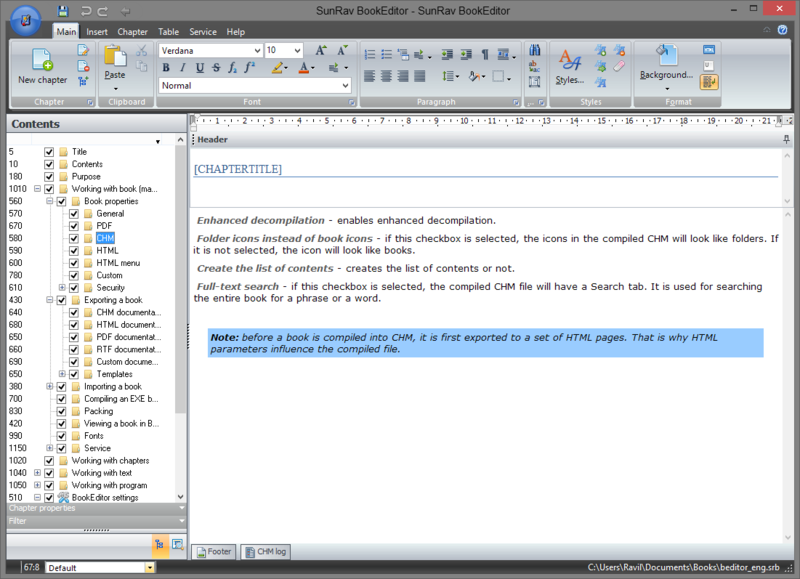 Ribbon interface is consistent with the design of Microsoft Office 2007–2013. Support files – insertion of images and multimedia files “on the fly” reduces book size and speeds up loading. Multimedia – insert images, video, audio, special characters, and YouTube, Flash, and GIF animations. Autoscrolling. Read a book without needing to touch the keyboard – the text scrolls itself. Voice. Hear your books as the computer reads them to you. Navigation. View book contents in tree format to quickly navigate across sections and chapters. You can read in full-screen mode. Search. Index and full-text search throughout a book make it quick to zero in on the text you want. Favorites. You can keep your most-needed chapters and books close at hand in the Favorites folder. Easy on the eyes. You can make the font bigger or smaller. Size changes are proportional for all fonts in the book. Reading history. Always be able to find a chapter you previously read. Visual layout themes let you configure book appearance just the way you wantу.